Johannes Vermeer, also called "Johannes Vermeer van Delft", lived from 1632 to 1675. His life was uneventful. With the exception of a few years in Amsterdam, it was passed entirely in his native city Delft, whence the words "van Delft" are affixed to his name, in order to distinguish him from others of the same name Jan Vermeer, or van der Meer, van Utrecht (1630­1688), and from the Vermeer, or van der Meer, van Haarlem (1656-1705). He must have been very poor indeed when he entered the Guild of St. Luke in Delft, and had to pay his entrance fee of six guilders in instalments, which it took him three years to complete. That his art became soon productive, however, may he seen from his self-portrait, which shows him richly attired and at work in a room of no mean appointments. In the midst of his prosperity he died at the age of forty-three, leaving his wife and eight children well provided for. No three artists could be more strongly individual than Maes, Vermeer, and de Hooch. They learned from Rembrandt the subtleties and mysteries of graduated light, but developed this with a keenness of perception all their own, even with greater refinement than their master ever sought. Jan Vermeer is original in the manner in which he bathes his interiors in a diffused silvery light, as de Hooch more favoured the golden sunlight in graded planes both were eminently light-painters. Sometimes Vermeer takes us outdoors, and then his light is a part of the atmosphere, as we may see in his "View of Delft" in the Mauritshuis, and in his street scene in the Six collection. But generally we find an interior the subject of the few works that have come down to us. There he places most frequently the figure in the foreground in shade, as if we are looking at the scene through a hole in the wall, or out of a very dark entry, while he admits the light through a window in the middle distance or in the background. Then he finds full play in letting this light fill the room in just proportion, from a bright wall to the shaded corner of the canvas. And by this peculiarity of his he has became the greatest painter of values ever known, that is, the value of the same colour under varying, receding intensity of light. Vermeer showed more interest in his figures than de Hooch did. They have more to do with the pictorial effect. He loved to introduce young women in some trivial occupation, and then his readily flowing brush moulds before us a figure with all the subdued intensity of vitality. But his main object was his conception and treatment of light that waves and shimmers in the ever changing effect of his magic play of chiaroscuro. Vermeer's colour was also peculiar to himself. Reynolds possibly never would have made his attack on the use of blue a half century later so - cleverly discredited by Gainsborough - if he had seen the use which Vermeer had made of that most unmanageable of colours. It is a favourite colour of our painter - a "moonlight blue," as Woermann has felicitously called it - which is familiar to every one who is acquainted with Vermeer's pictures. It intensified his height of light and made it transparent, vibrant, scintillating. He combined therewith certain shades of yellow that gleam and sparkle in his illuminated surfaces and in his tender flesh-tones. His technic is unctuous, or smooth and satiny, or even grainy, almost rough, but always marvellous in its knowing ease. One of the best examples from which this wonderful painter may be studied, both for colour and brushwork, hangs in the Metropolitan Museum of New York. His "Woman opening a Casement " may be ranked among his masterpieces. 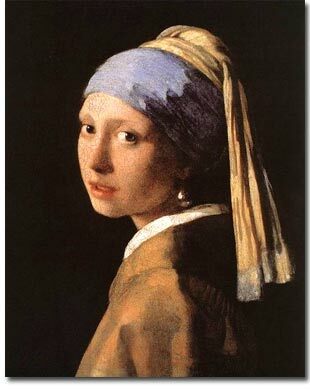 Other famous paintings from Vermeer are the "Milkmaid" and the "Girl with a pearl earring".